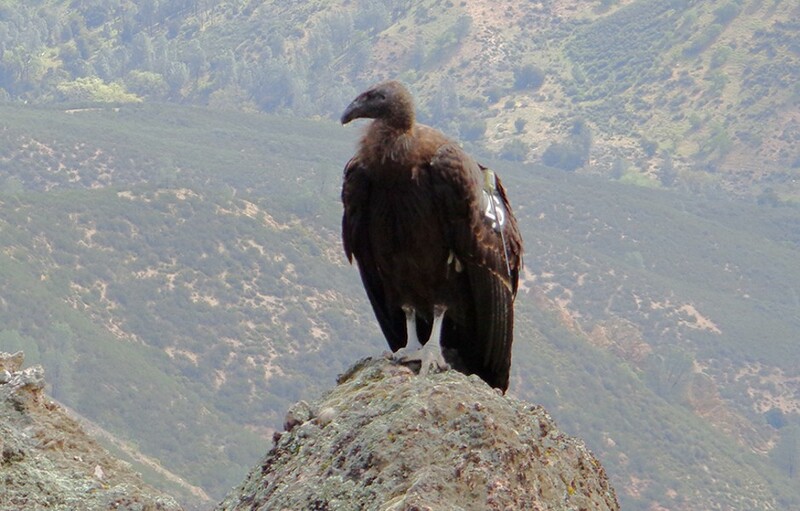 Photo by Barry Evans Released into Pinnacles National Park on Feb. 27, 2013, condor number 626 sports a tiny radio locator on her flank. Photo by Barry Evans High Peaks Trail winds in and out of the park's wickedly eroded rock towers and gullies. While many of us are enraptured with our local bald eagle fledglings (http://www.ustream.tv/channel/humboldt-bay-eagle-cam), California condors are making a slow but steady comeback from the brink of extinction a few hundred miles away. Visitors to the nation's newest national park, Pinnacles, have the rare opportunity to see condors in action. The park is one of two release sites in California (the other is near Big Sur), and currently more than 30 free-flying, but closely monitored, condors make the park their home. 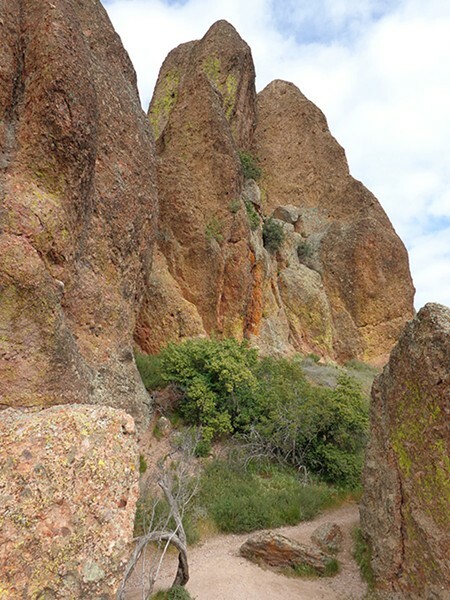 The remnants of half of an extinct volcano can be found in Pinnacles, about 80 miles southeast of San Jose. The other half is nearly 200 miles away. Soon after its formation 23 million years ago, Neenach Volcano split in two along the San Andreas fault system. Since then, the western half has crept northward about half an inch per year, during which time erosion has reduced the once-towering half-volcano into a series of sculpted rock formations ­— hence "Pinnacles." Here, angular chunks of rock and gravel are cemented into a tightly knit matrix known as breccia. The unusual igneous composition (andesite and rhyolite) of Pinnacles breccia exactly matches that of rocks found 200 miles to the south, near Neenach in Los Angeles County. This fact was used to bolster the then-newly minted geological theory of plate tectonics in the late 1950s. Although the volcano is long dormant, seismic activity associated with the fault zone is still commonplace. One serendipitous result of the ever-shifting earth is the creation of two enticing talus caves, where enormous boulders have fallen into narrow gorges, wedging themselves into cracks but leaving sufficient space underneath to walk or wiggle through. Since colonies of Townsend big-eared bats breed in the caves, they're off-limits to visitors during pupping season. On a recent visit to Pinnacles, my wife and I were treated to the sight of half a dozen of the huge raptors circling and swooping in updrafts above "Condor Gulch," looking for carrion. One even posed fearlessly nearby, which amazed us until we read that this particular condor had spent most of her life in a breeding facility in Portland. Hatched in May 2011, she was released in the park last February. Bird number 626 "is the most submissive bird of the 2013 cohort, spending a lot of her time away from the other juveniles in the pen," according to the California Condor Recovery Program website. After reaching sexual maturity at 5 or 6 years old, female condors usually lay a single egg each year. The birds mate for life and typically live at least 50 years. Pinnacles-released condors are currently caring for hatchlings at three nests in or near the park. These near-extinct birds — only about 400 remain, half of which are in captivity — deserve our care and protection. Their particularly strong digestive juices have made them vulnerable to lead shot and bullets in the dead animals on which they often feed. Additionally, power lines, poachers, habitat destruction and egg collecting have all taken their toll, so the long-term future of California condors is still far from assured. If you're not convinced that these magnificent birds are worthy of our care and protection, a visit to Pinnacles National Park will convince you. As you watch these great creatures, whose 10-foot wingspan is the largest of any North American bird, soaring overhead, your heart may soar with them.